Hyman Rickover? Martin Vanbee? Eleanor Roosevelt? Harry Myers? Laurence J. Peter? Sam Levenson? Oliver Wendell Holmes Jr.? Oliver Wendell Holmes Sr.? Anonymous? This construction has been attributed to U.S. Navy Admiral Hyman G. Rickover. Would you please explore this topic? Quote Investigator: Rickover did employ this joke during a speech in 1983, but it was circulating decades earlier. Nicholas Murray Butler? Tommy Lasorda? John Newbern? Laurence J. Peter? Anonymous? Dear Quote Investigator: There is a humorous three-fold categorization of people. The first group contains those who make things happen. Are you familiar with this saying? Would you please examine its provenance? The vast population of this earth, and indeed nations themselves, may readily be divided into three groups. There are the few who make things happen, the many more who watch things happen, and the overwhelming majority who have no notion of what happens. Every human being is born into this third and largest group; it is for himself, his environment and his education to determine whether he shall rise to the second group or even to the first. Some periodicals and reference works identified Butler as the coiner of this expression, and researcher Barry Popik identified the pertinent speech. Art Buchwald? Henry James Lee? Mrs. Kenneth Clarke? Linda Godeau? Laurence J. Peter? Anonymous? This phrase has been attributed to the humorist Art Buchwald and the quotation collector Laurence J. Peter. What do you think? A person recently bereaved of an only sister, wrote to a friend: “Isn’t it wonderful that the really fine things of life are not things at all.” And so it is. Love, friendship, appreciation, kindness, honesty, thrift, and a multitude of life’s finest qualities, are intangible and spiritual but nevertheless, very real. Laurence J. Peter placed the saying in one of his collections in 1982, but it was already in circulation. Art Buchwald was connected to the saying by 1989, but there was no substantive evidence that he crafted it. Christopher Marlowe? Laurence J. Peter? Evan Esar? Anonymous? In my opinion, this expression is not from the 1500s and crediting Marlowe is nonsensical. Nevertheless, many websites dedicated to quotations present this dubious ascription. Would you please explore this quotation? Perhaps you could uncover the source of this inanity. Money cannot buy love, but it places one in an excellent bargaining position. 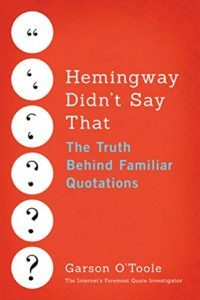 QI believes that the flawed attribution to Christopher Marlowe originated with the misreading of an influential book of quotations that was compiled by Laurence J. Peter and published in 1977. The details of this citation are given further below. Henry Kissinger? Wallace Sayre? Charles Frankel? Samuel Johnson? Jesse Unruh? Courtney Brown? Laurence J. Peter? Academic politics are so vicious precisely because the stakes are so small. But I have also seen it attributed to the political scientist Wallace Sayre. Could you examine this adage? Politics on the university campus are the worst of all kinds of politics because the stakes are so small. Campus politics are so nasty because the stakes are so small. The republic of learning and letters works by especially bitter squabbling because the stakes are so small. It is not easy to discover from what cause the acrimony of a scholiast can naturally proceed. The subjects to be discussed by him are of very small importance; they involve neither property nor liberty; nor favour the interest of sect or party. The various readings of copies, and different interpretations of a passage, seem to be questions that might exercise the wit, without engaging the passions. But whether it be, that small things make mean men proud, and vanity catches small occasions; or that all contrariety of opinion, even in those that can defend it no longer, makes proud men angry; there is often found in commentaries a spontaneous strain of invective and contempt, more eager and venomous than is vented by the most furious controvertist in politicks against those whom he is hired to defame. Though I do not know much about professional politics, I know a lot about academic politics — and that is the worst kind. Woodrow Wilson said that Washington was a snap after Princeton. It used to be said of politics on the university campus that it was the worst of all kinds of politics because the stakes were so small. We should be able to take at least minor comfort, then, from the present situation in the educational world: The stakes today are not at all small.